The moment the news broke out concerning the launch of Netflix in Nigeria, everyone has raised concerns about the cost of data that will be incurred to even watch a movie for an hour. 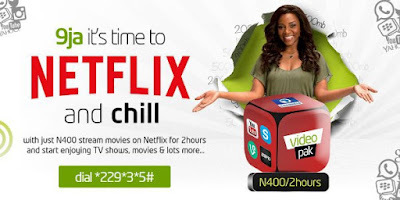 Nevertheless, Etisalat Nigeria has quickly swung to the rescue with the launch of the Etisalat Netflix package that offers 2 hours of streaming on Netflix for just 400 Naira. If you were to go to a cinema, i guess you know how much the pop corn and ticket will look LOL. Anyways, see subscription code for the Etisalat Netflix Package below. To subscribe to the Etisalat Netflix Package, simply dial *229*3*5# and make sure you have a minimum balance of 400 Naira before dialing the code.